I must confess that it took me a long time to recover from the jump between film and digital photography. Shutter speeds and F-stops made sense. But these new gadgets and all their buttons seem so irregular and complicated. I was just beginning to feel good about my digital Lumix when this college kid shows up with a drone and a phone. 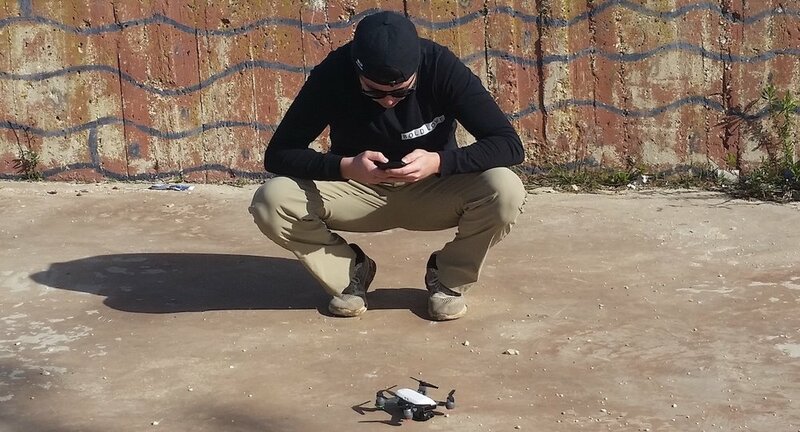 Cody, his phone, and his drone. Nazareth, Israel. The drone was not much bigger than a deck of cards (with rotors retracted). The phone, was, well, a phone . . . but it had an app that controlled the drone! It blew up my world. Cody was a crazy-good pilot. He could fly that little whirlybird in and out of the palm of his hand. He buzzed the treetops, circled the moon, chased the cows, and we watched the whole thing happen in real-time on his phone. Cody was one of our Bible Land Explorers who walked the Jesus Trail in January of 2019. He sent me this edited clip of the experience. It looks like another technological curve is ahead of this old dog. And the next time we do the Jesus Trail, you really should join our merry band. Note: all the clips featured here were taken along the Jesus Trail except the last. The view to Jerusalem was taken from the Haas Promenade just south of the city. We have seats available on a couple of trips scheduled for summer of 2019. Registration will be closing soon on our May 25-June 4 excursion as well as our June 4-15 trip. These are similarly paced and priced. If you are interested in either please contact me immediately at markziese@gmail.com. Tabitha was a part of our Jesus Trail 2017 trip. In addition to sharing her wit and smile, she made this short GoPro video available to us. “What does that do?” I ask, as I come up the trail behind a middle-aged woman. I eye a widget dangling from a ‘biner on her backpack. We enter the manicured grounds of the Church of the Primacy of St. Peter. Here, on the edge of the Sea of Galilee, we remember Peter's restoration. I knew it was coming and yet his words still catch me by surprise. Husam’s face is sober. His words are deliberate. Moses had a mentor. And, according to the biblical text, a father-in-law. Eight take-aways from my recent Wilderness First Aid course that were taught, caught, or just dropped. John called us Woofas. I thought I heard wrong. Then he used the term again. Other confused looks prompted a clarification: "A Woofa is a someone in our Wilderness First Aid program" (Get it, WooFA?). So you are all pumped for the Jesus Trail hike but are a little nervous about the shape of the trail, the limits of your own physical abilities, or the simple fact that you haven't been back in the woods since the Bigfoot scare of '67. Let me assuage your fear. Thousands of sightseers view the land of the bible through the window of a tour bus. A few seek a deeper experience. If you are among the latter group (or know someone who is), I invite you to try Galilee on foot. There is no better way to slow down and appreciate the natural beauty of the Heartland. For those who are veterans of a standard study- or pilgrimage-tour, this may be the perfect way to build upon that previous experience. This line from the twenty-third Psalm offers comfort in times of trouble, assurance in moments of fear. It has been a whispered prayer of believers through the centuries. We sat uncomfortably in the classroom, rocking from side to side, trying to absorb the Hebrew text of Pirke Avoth. This portion of theMishnah claims that Moses carried not only a hard copy of Torah down from the mountain, but an interpretive oral tradition as well. The latter was chewed, memorized, and repeated from mouth to ear for more than a thousand years. When it was finally committed to writing in the early centuries of our own era, the achievement for Rabbinic Judaism was enormous. The sayings of the fathers was frozen for all time. Future students would have much to ponder. I descend into the gorge of the Wadi Hamam. The rising sun plays hide and seek with the rocks. It is a beautiful morning to be out and about, pack on my back. The air is cool. There is not a soul in sight. The Sea of Galilee glitters in the distance. In the savage heat of July 3-4, AD 1187, the Crusader army thumped east from Sepphoris. They stopped to draw water from a spring, presently located behind the McDonalds with the McDrive Thru (Birket Maskana). The goal of the march was ostensibly to relieve the citadel at Tiberias. In a short time, however, that Crusader plan would be reduced to something more primal. Salah-ed-Din’s eyes narrowed when he received the news. His siege of Tiberias had achieved the desired result. Guy was lured into open country. I put my nose on the sun.